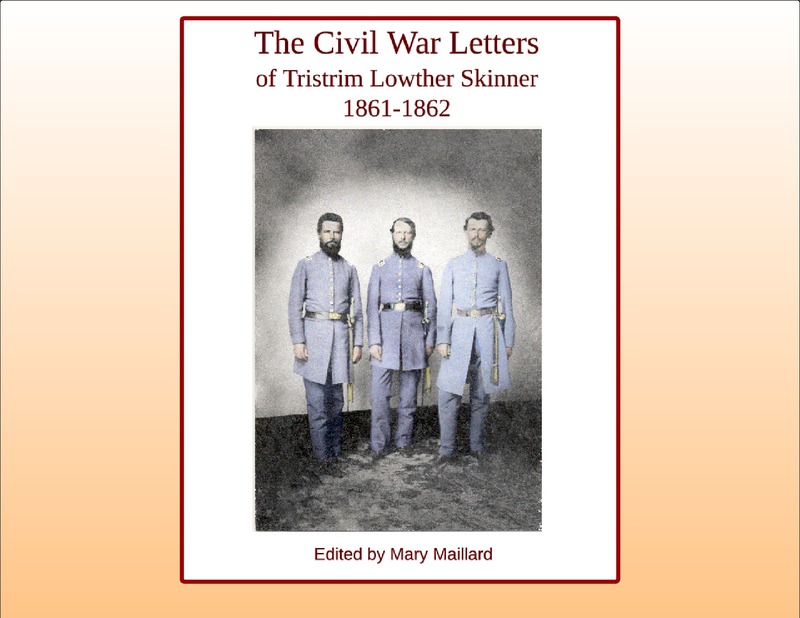 The Civil War letters of forty-one-year-old Captain Tristrim Lowther Skinner of North Carolina’s Albemarle Guards constitute a literary masterpiece. Part newsletter, part diary, part marital conversation, these ninety letters written to his wife, Eliza, cover one year from June 1861 to June 1862. In carefully detailed, often lively prose, Captain Skinner describes camp life outside Richmond: medical concerns, home news, military strategy, religious views and newspaper accounts. He wrote Eliza long letters at least twice a week, advised her on plantation household management, and followed as best he could the growth and development of their four children, aged seven, five, three, and one. 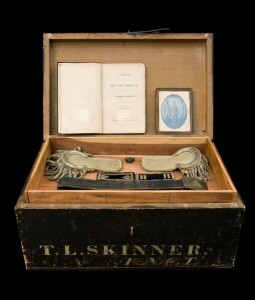 Tristrim Lowther Skinner’s Civil War trunk, marked 1st N.C.T. Photo by Mark Banka, courtesy Frances D. Inglis. An almost unbearable suspense hung over Skinner’s camp in late 1861 as Union General George B. McClellan failed to articulate or enact strategies to advance against Confederate forces. A corresponding tension builds in Skinner’s letters as he waits weeks, then months, for furlough to return home for the birth of his fifth child. He missed the birth but arrived home in time for the Fall of Roanoke, the destruction of his ironclad steamship Curlew, and the occupation by federal forces of Albemarle Sound in the early spring of 1862. Along with other elite planter families, Skinner escorted his wife and children to Oxford, North Carolina, where they refugeed until the end of the war. Promoted to Major in April, Skinner participated in the build-up to the Peninsula Campaign, and in mid-June, his regiment joined Ripley’s Brigade. His first battle – the massacre known as the Battle of Beaver Dam Creek or the Battle of Mechanicsville – would be his last. He was killed almost instantly when struck in the chest by a miniball. Of the more than fifteen hundred men who mustered into the 1st Regiment North Carolina State Troops, only ten officers and sixty-one soldiers surrendered at the end of the war. 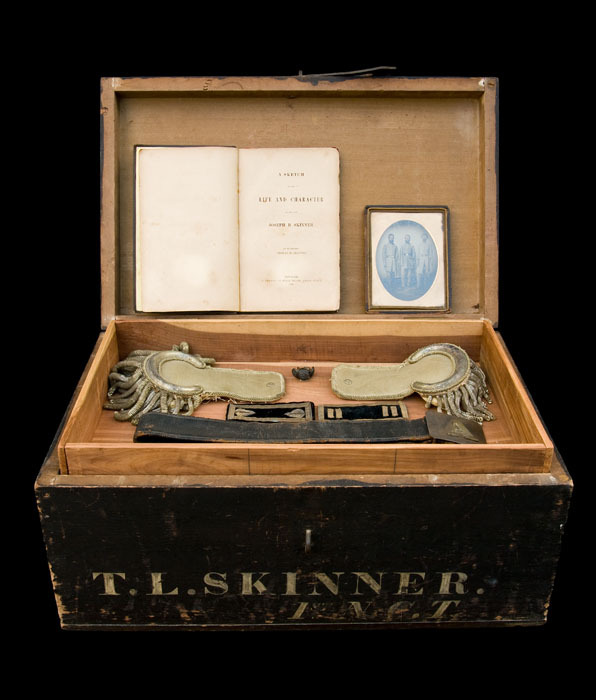 Skinner’s correspondence presents a close-up view – perhaps the only view – of North Carolina’s Albemarle Guards, relays credible reports of occupied eastern North Carolina, and offers a nuanced portrait of a marriage both strengthened and strained by separation and uncertainty. A glimpse of the defeat at Ellison’s Mill, June 26, 1862. Drawn by Alfred R. Waud. Library of Congress. 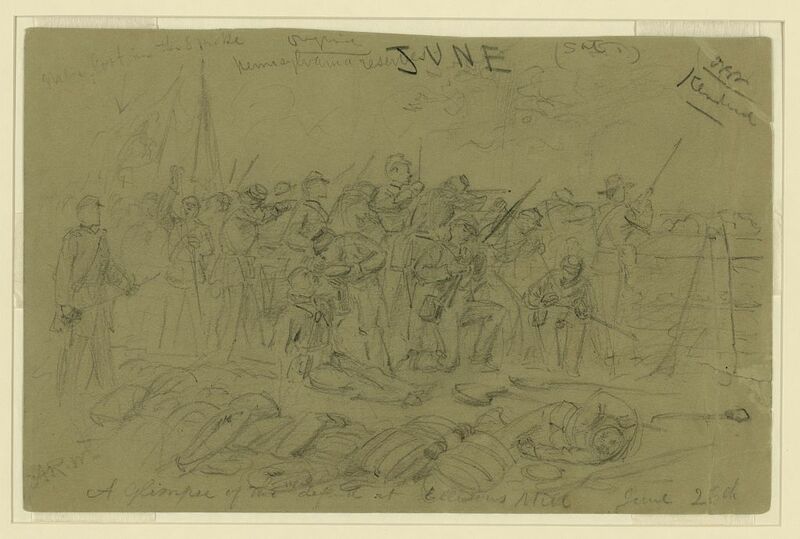 Battle of Beaver Dam Creek, drawn by Alfred R. Waud, June 26, 1862, and publlished in Harpers Weekly, July 26, 1862. Library of Congress.